GREECE (The Nil Admirari) - Earlier today, all Greeks who lived outside the capital of Athens decided it was time to break into the city-state model again to show the complete lack of cultural and political unity in Greece. The announcement was made by the Greek people in response to the Syriza government in Athens betraying Greeks by agreeing to a harsh bailout from the European Union (EU). "The government in Athens won't be around too much longer after accepting the deal from our loan sharks in the EU. They demanded more austerity measures to keep Greece a debt slave for the foreseeable future, and our government folded after promising it wouldn't," stated Yanis Varoufakis, who resigned as finance minister and likened the harshness of the deal to the Treaty of Versailles. 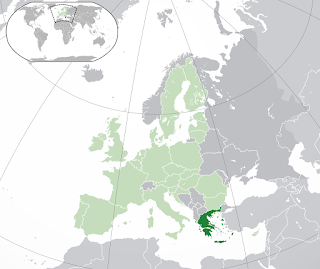 Greece (in dark green) and its European Union loan sharks (in light green). Varoufakis added, "I think the breakup of Greece is a good thing, because if we don't do it ourselves the crime syndicate running the EU and the banks who keep forcing us to take loans will eventually break apart Greece and sell the country off in pieces. It will be nice to get ahead of that." "There will be 145 Greek city-states with their own governments, treasuries, and armed forces. And 144 will declare their independence from the government in Athens by the end of the day. Athens can hold the bag," stated Nadia Valavani, who resigned as deputy finance minister. Greek Prime Minister Alexis Tsipras was last seen playing Russian roulette with Russian President Vladimir Putin, who promised Russia would pay all of Greece's debts if he lost.